← 2016 Programme of Work is Released. 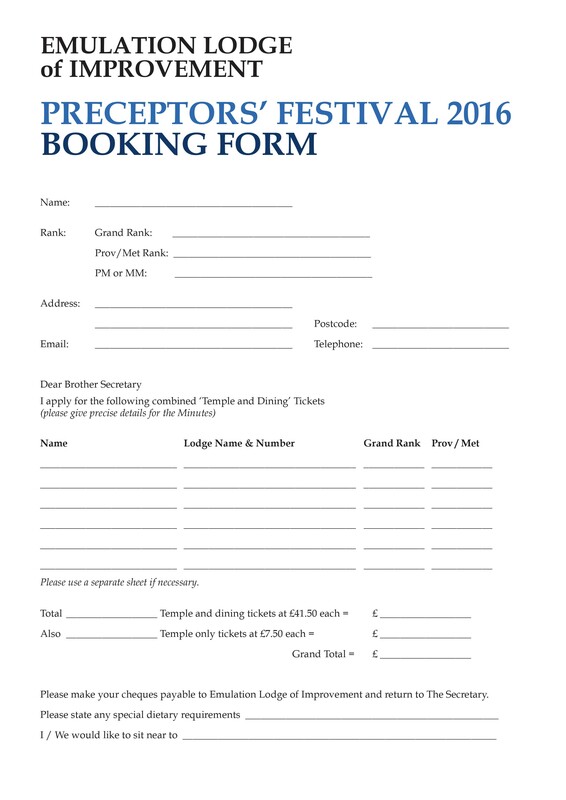 Emulation Lodge of Improvement will hold its Preceptors’ Festival at Freemasons’ Hall, Great Queen Street, London WC2B 5AZ on Friday 24th June 2016. This year we will be demonstrating the Ceremonies of Initiation and Installation and the Committee very much hope you are able to attend what we believe will be a real showcase of ritual excellence. AT 3.30PM AND LODGE AT 4.30PM. DINNER WILL BE SERVED AT THE GRAND CONNAUGHT ROOMS. This entry was posted in Uncategorized and tagged 2016, events, Freemason’s Hall, Preceptors' Festival. Bookmark the permalink.